My 2013 Sea Trout season has been an unforgettable EXPERIENCE. 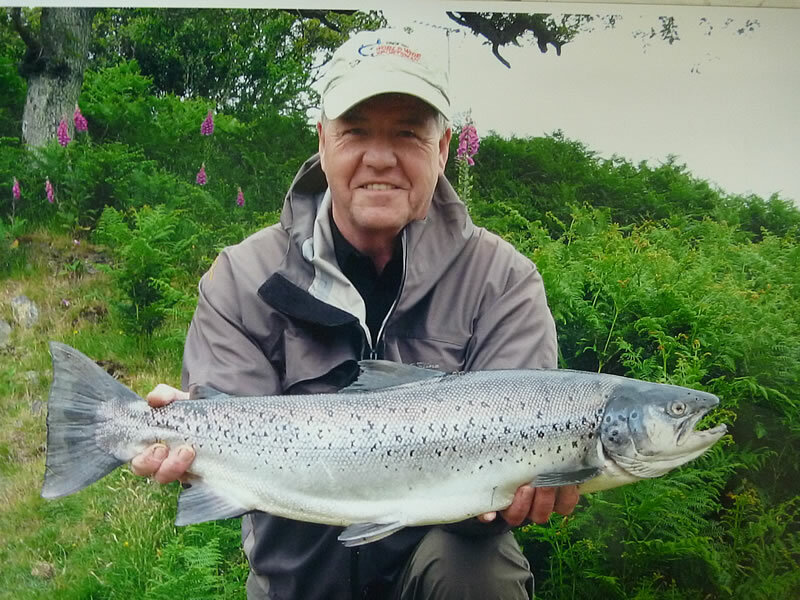 I am lucky to be a member fishing on the famous River Dovey in Wales, probably the best sea trout river in the UK, certainly for specimen fish. I waited a mere 15 years to be accepted into the New Dovey Fishery Association, I had waited so long that when I was finally asked to join i had forgotten that I had even applied for membership. That was 9 years ago and what a tremendous journey it has proved to be. During my first season I was lucky to meet and become a friend of the now Secretary of the Association, Richard Evans, a local expert on the river and his advice to me has proved to be invaluable. My first fish from the river was a high water daytime fly caught fish of 11.5lbs, a great start! Catching our sea trout in day light hours during summer time low water conditions is difficult enough because of the gin clear water when you add very spooky fish it becomes mission impossible, so most of the fishing is done in the hours of darkness. For me the most magical form of fishing, the best and most exciting way to catch those enigmatic creatures. Fishing at night became a passion for me, catching fish when you can see what you are doing is difficult enough but when you fish in the blackness of the night your instincts have to be in total control, casting has to be perfect, a miss timed cast, forward or backward can result in disaster, trees on the opposite bank somehow become a lot closer, and even the smallest obstacle behind you gets in the way, all adding to the difficulty, then when you hook a fish not knowing where and what the fish is doing adds to the excitement. You will either love night time fishing or hate it. Fortunately I LOVE IT !!!! Over my years of night fishing on the River Dovey I have developed a desire and passion for surface lure fishing, most of my big fish from the river have been taken by this method. 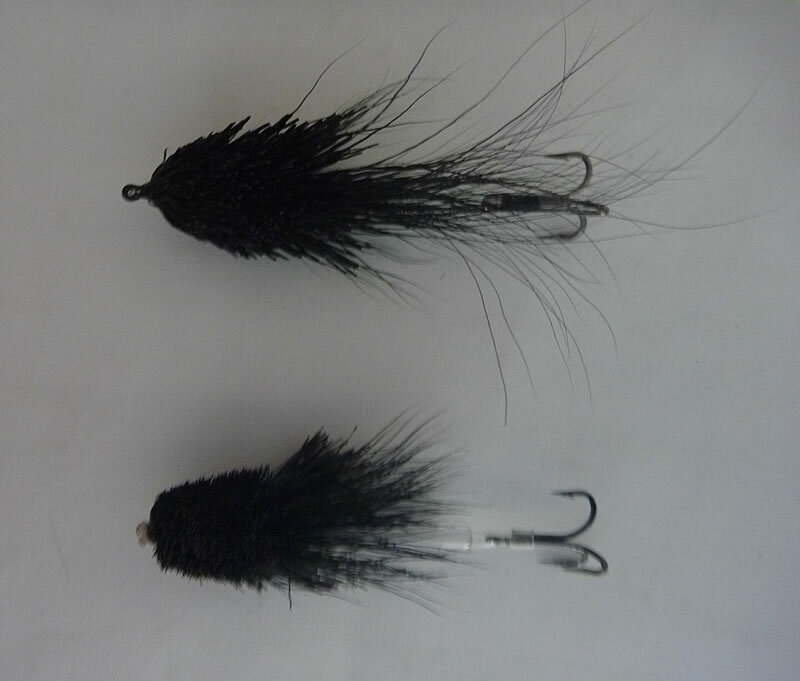 I tie them in two different ways; the first is tied muddler style onto a plastic tube. The second with a Guideline Xtra strong size 10 or 12 salmon treble tied onto a heavy fluorocarbon mount which is then whipped and super glued onto a low water salmon hook, then the muddler type body is spun onto the low water hook and after trimming the low water hook is cut off, leaving just the treble behind the body. I tie them in black deer hair in sizes varying from 1 1/2ins up to 3 1/2ins, both work very well. The top one tied onto a mount and the bottom one tied onto the plastic tube. The surface lure fishing takes place in low water conditions in total darkness ( The darker the better ) Their eye site must be incredible, on the darkest of nights when I cant see the lure when held right in front of me they seem to be most aggressive. A 10ft 7wt single hand Reaction coupled with a 4 Cast floating line loaded onto a Quadra reel is the ideal combination for the situation. The takes are normally vicious, an eruption on the surface and the rod is almost pulled from your hand and the fun begins, but some nights the takes are silent and the first indication is the line tightens and the fish is on. On rare occasions they take as you are lifting the surface lure to re cast, that provokes the most explosive reactions, the fish follow into the shallowest of water and smash the lure as you lift off. On some nights you will get a lot of fish attacking the lures and you can hear and feel the fish hit the fly but you cannot connect, frustrating but exciting. A change to a smaller surface lure on occasions like this does sometimes provoke a hook up. As the season progresses and the sea trout have been in the river for a while, their aggression towards the surface lure increases, it really annoys them. End of season fish like salmon get dark but their fighting capabilities remain. I return all but maybe an odd early fresh fish. The best water for the surface lure is normally the shallower, oxygenated tail of the pool, the fish would not be there in the day light hours, but tend to lie there in confidence in the darker hours. I normally start fishing with traditional tubes/flies in the deeper pools and change to the surface lure when it is properly dark. I vary the rate of retrieve, sometimes they want it fast and sometimes slower, also I change the angle of the cast, varying from square to 45 degrees down stream. Keep ringing the changes. This year has proved to be exceptional. 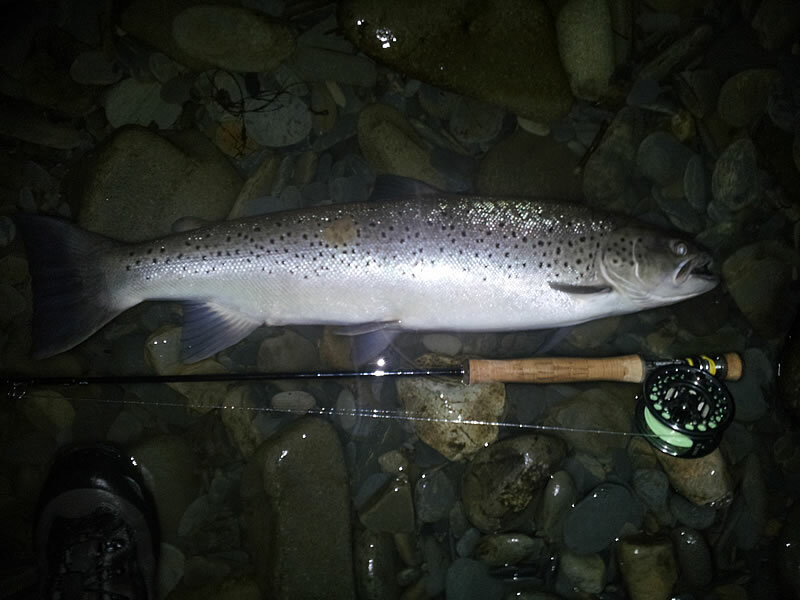 Sea Trout over 10lbs for the UK are rare creatures, this season the river has produced some enormous fish, fishing at night has been possible most of the season, with very little high water, perfect conditions. My own season has been my best ever for big sea trout, with no less than 8 fish over the magical 10lb barrier, the best two at 16.5lbs and 14.75lbs Most on surface lures. MAGICAL !!!!!!!!!!!! a great EXPERIENCE. Previous LPXe MicroWave – evolution or revolution? Next Take your kid salmon fishing! Trout is in now where we’re at. If you ever come to our city fort myers please call us and book a fishing charter with us. I provide the best time for you and friends and family. Personal attention is all about our crew.